Hello Friend, Welcome to my blog. I am shubha das founder of ITDS HUB. This is my personal blog and this is my first post on my blog. I am so exciting to create this post. This post is based on Google. We know that Google is the biggest technology based company in the world. It was founded in the year of 1998 by Larry Page and Sergey Bin. Now Google market value worth is $470+billion approx. Every person who uses the internet knows about Google. I think 90% users use some google product for instances Gmail, Youtube, Google Map, Google Play Store. But some users don’t know about another google tools & product which is useful. 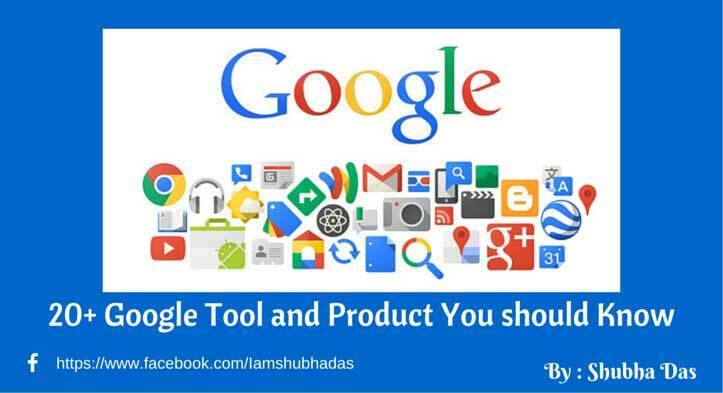 Today I will share those Google Tools & Products which you should know. 2. Google Slides: Google slides is the best online presentation creating tool. You create an attractive presentation by this tool. You can download the presentation with a different format. It is the alternative of MS-Powerpoint. 3. Google sheets: This is the best online spreadsheet tool which has the outstanding feature. It is the alternative of MS-Excel. 4. Google Forms: Google form is a tool which has some great feature. You can plan events, create a quiz for the student, create survey or poll, collect another information by this tool. 5. Google Calendar: Google Calendar helps to remind your friends birthday & you can save your event Information. 6. Google Drawings: If you are interested in drawing, then this is a smart online drawing app. 7. Google Keep: Google keep is the another tool which helps you to save information which you currently thought. 8. Google Drive: Google drive is a free cloud storage. You can upload your important documents on Google drive and access them anywhere when you need. 9. Google Translate: Google translate helps to translate another language into your own language. 10. Google+: Google+ is the another way sharing information with your friends. 11. Blogger: It is a free tool for the blogger. You can create your blog without buying web hosting. 12. Hangout: It is messaging app user. By this app, you can make the free video call, messaging. 13. Groups: Create a group and share information, images, videos on the group. Share your discussion on the world. 14. Google Contact: Google contact save your email contact and phone book contact. 15. Google AdSense: If want to earn money from the Internet then Adsense is the best way make money on the Internet. 16. Google Adwords: If you want to advertise your product, then create an account on Google Adwords. 17. Google AdMob: If you want to monetize your android app then Admob is the better solution. 18. Google My Business: This also helps to grow your business, and helps to get the customer. Customer finds your company or organization on Google map. 19. Google Apps For Work: It has many features. You will get business email, cloud storage and much more. 20. Panoramio: This is the photo sharing community developed by Google. 21. Google Trends: It is the tool by which you will get information about trending stories. You can also get information about which people most searches on Google. This is the list of essential Google Product which is the help to your daily life. If know another interesting app or know another Google product, then comment below. Hey, I am shubha das a blogger from India. I am the founder of a tech ITDSHUB. I love to write, Coding, Designing, watching the movie. I love blogging because this is my passion. Shubha Das Copyright © 2019.